My incredibly talented friend, Max Langert, is at it again. On Sunday, April 23, he is producing a variety show called Night of the Peacock at Mayfield Park with proceeds to benefit SAFE. Mayfield Park is longtime home to many generations of peafowl in a gorgeous natural setting near the shores of Lake Austin. 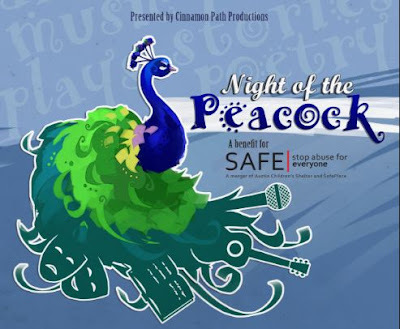 Musical guests, poets, storytellers and theatre folk will perform at Night of the Peacock. (I am one of the storytellers. Come hear me perform my story titled Powerless Peacocking about my encounter with a pickup artist.) SAFE stands for Stop Abuse For Everyone, and is a newly formed nonprofit alliance between Austin Children's Shelter and SafePlace. This is a truly necessary organization, much deserving of funding. The show starts promptly at 6:00 PM on Sunday, April 23. Seating begins at 5:30. Come early to enjoy the park and meet some majestic peacocks. Mayfield Park is located at 3505 West 35th Street in central-west Austin. Click to buy your tickets here! Bring cash for fresh-baked sweet treats from Casa de Glaze mobile bakeshop and raffle tickets for a prize basket that includes a gift certificate to one of my very favorite Austin restaurants, The Beer Plant!